Tucked away beside the north entrance to Barcelona cathedral there is a small stone sculpture of an extremely hairy knight fighting what looks like a griffin. The knight is Wilfred the Hairy (Guifré el Pilòs) who was Count of Barcelona from 878 until his death in 897. Wilfred the Hairy was born in 840 in Prades (France) and was the Count of Urgel, Cerdenya, Girona, Ausona Barcelona and Besalú, titles which were given to him by Charles the Bald and his son Louis the Stammerer. At a time when most of what is now Catalonia was part of the the Carolingian empire and the majority of the Iberian Peninsula was ruled by the Emirate of Córdoba. Wilfred the Hairy united his territories and repopulated the area surrounding Vic which had become a no-man’s land separating Christian and Muslim controlled areas. By the end of the 9th Century the Carolingian empire had begun to disintegrate and Wilfred the Hairy was the first of the Catalan counts to transfer his titles by inheritance to his sons. Because of this he is often credited with being the founder of an independent Catalonia. He died in 897 defending Barcelona from the troops of of Lubb ibn Muhammed. There are several variations on this legend which is commonly attributed to the 16th century historian Pere Antoni Beuter. 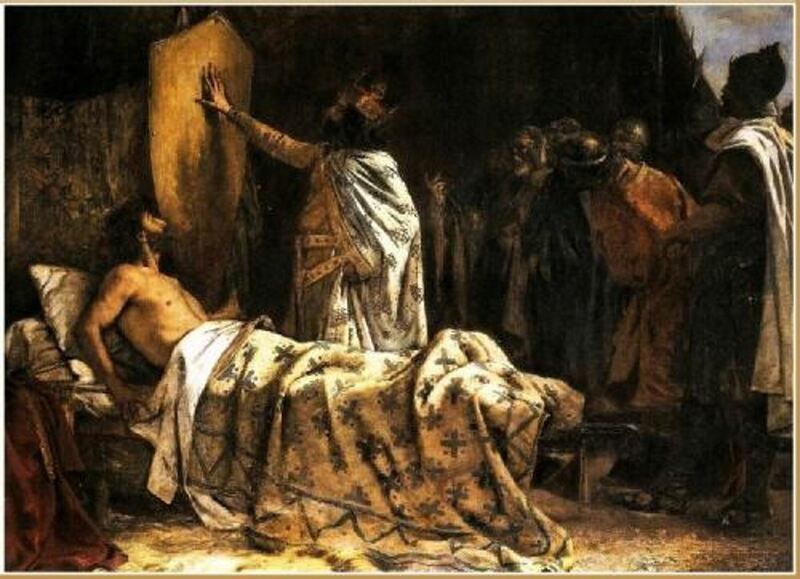 Other versions of the legend combine the two stories by saying that the golden shield was first given to Wilfred the Hairy by Charles the Bald and then the 4 bars added by Louis the Stammerer. Either way, it is just a legend and unlikely to be true since coats of arms and heraldic shields didn’t start to be used until some time in the 12th century. The second legend attributed to Wilfred the Hairy is basically a slightly modified version of the legend of St George and the dragon. Allegedly, the Moorish Caliphates brought a young dragon with them from Africa. Half reptile and half bird, the beast lived in a cave near Sant Llorenc del Munt where it ate the locals’ cattle and grew to giant proportions. As it grew the monster got steadily more bloodthirsty and terrorized nearby towns and villages. Wilfred the Hairy sent his best knights to fight the dragon but they were all defeated. 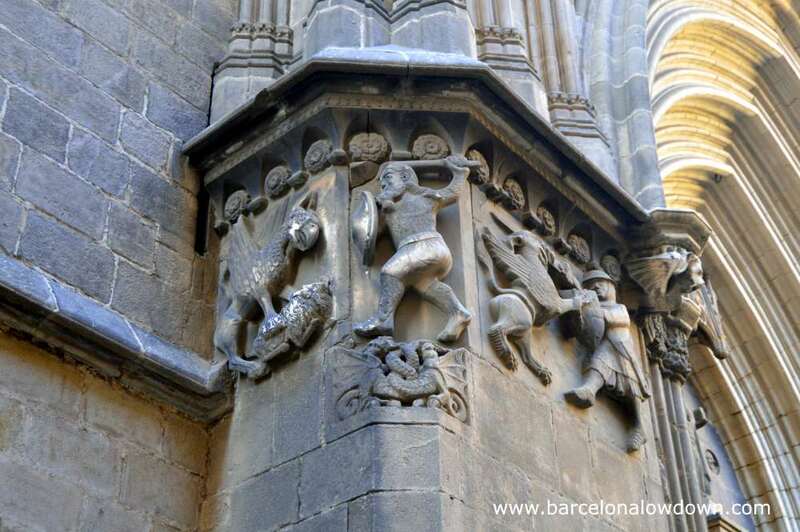 The sculpture is located to the left of the cathedral doors as you face Barcelona cathedral in the Plaça de Sant Iu. This entry was posted in Catalonia, History, Interesting & Amusing tagged gothic quarter, medieval, sculpture and updated on October 25, 2016 by Richard.